Here are your final power lunch talking points for the week: Fox News’ Laura Ingraham provided white nationalism’s “dog whistle,” or as CNN described it, “an airhorn, or perhaps a primal scream,” on her show this week. Ingraham said Wednesday night, "The America we know and love doesn't exist anymore. Massive demographic changes have been foisted on the American people, and they are changes that none of us ever voted for, and most of us don't like." Whew. Micah Clark of the American Family Association of Indiana has lined up against hate crime legislation sought by Gov. Eric Holcomb and will be drafted by Cicero Republican Rep. Tony Cook. “Indiana already has the ability to enhance the sentences for any victim for any crimes and judges have had that ability for years,” Clark told Indiana Public Media of the pending legislation. “So, what the governor is wading into is really symbolism over substance. I think he needs to be careful because he’s not as popular as some of his media clips tell him.” A July Morning Consult Poll showed Gov. Holcomb’s approval at 52% and his disapproval at 23%. Those are the best ratings for a governor in the Midwest. That survey was taken before Holcomb announced support for a hate crime law. Hoosier Republicans loathe Nancy Pelosi and raise her name constantly. Republican Senate nominee Mike Braun answered a Howey Politics Indiana question on tax reform by saying that Sen. Joe Donnelly’s “cohort, Nancy Pelosi, referred to it as crumbs.” NBC reports that 42 Democratic House nominees have said they will not vote for Pelosi for leadership as well as nine incumbents. In the Indiana context, 2nd CD nominee Mel Hall said he won’t back Pelosi. “I do not currently support and will not support Nancy Pelosi for leadership in the next Congress,” Hall said in July. “Washington is broken – and career politicians in both parties are to blame. People are working hard in the 2nd District, but Congress isn’t working for them. And, in my experience on the farm, as a minister, and in business, when something isn’t working, you fix it.” And Ohio U.S. Rep. Tim Ryan, who keynoted the Indiana Democratic Convention dinner in June, is mulling another challenge to Pelosi. “I’ve not closed the door on it,” he told MSNBC. Have a great weekend, folks. 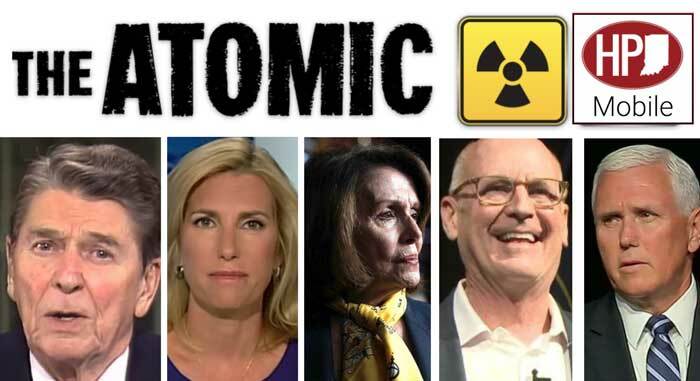 It’s The Atomic!